I know what you're going to say. Bev, haven't you read Whose Body? 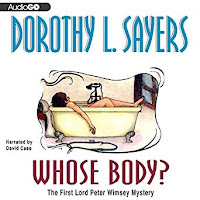 by Dorothy L. Sayers like a couple hundred times? Well...maybe. But I like to have audio novels to listen to when I run around in the car and it's helpful if they're stories that I've already read. 'Cause my middle-aged brain doesn't hold on to new stories so well when I just listen to them. Especially if I'm not in a position to take careful notes (that doesn't work so well when driving....). 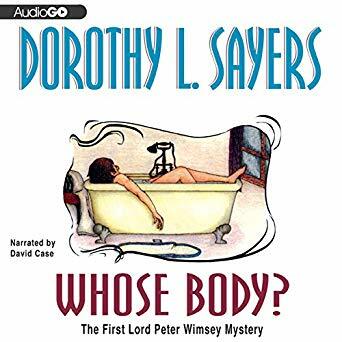 Also--up till now the only person I've listened to reading the Lord Peter stories has been Ian Carmichael and I thought I'd give this version with David Case a shot when I saw this version on my library's shelf. So--this review is of the audio novel performance and NOT a review of Sayers's work. My review of the story may be found HERE. I have to say that Ian Carmichael spoiled me. He was the first Lord Peter I ever heard on CD and he was the first Lord Peter I saw on screen. I love his performances in both media. I dearly wish that he had been able to convince someone to do the Sayers stories when he first brought it up (and was young enough to really be appropriate for the earlier stories). His experience playing Bertie Wooster would have made him perfect as a screen version of Lord Peter in Whose Body? (an episode that never got televised btw). He manages a perfectly splendid Bunter and Parker in the audio novels too. I'm afraid that David Case had a very tough act to follow and he did a poor job as LPW. His snobbish, superior tones are perfect for Sir Julian Freke who seems to think he is above everybody and everything. He also gives the But he gives Lord Peter, Bunter, and Parker none of the humanity that makes them people that their fans would want to know. Lord Peter, though his tones are differentiated from Freke's, still has an air of looking down his nose on folks--even his good friend Inspector Parker.